Hi folks! Do I have a treat for you! My very talented blogger friend Sarah has written a post for the Happy Handbook. Enjoy her thoughts on exercise and happiness and be sure to check out her fabulous Ontario Wine 101 blog. 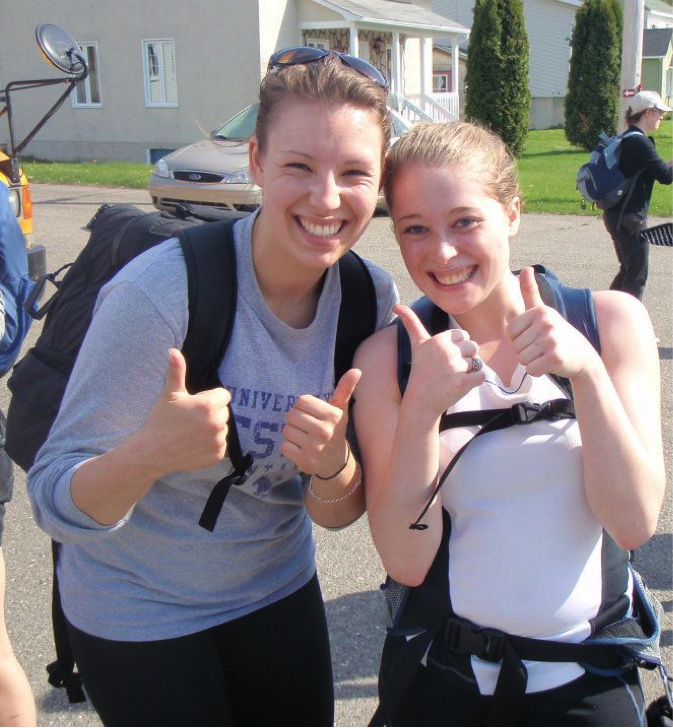 Sarah Emms and her friend, Celine McGarvey, after an 18-kilometre hike in Trois-Pistoles, Quebec. Look at those endorphins in action! Hello! My name is Sarah Emms, and Julie is letting me guest blog for her today here at The Happy Handbook, which is one of my favourite blogs. I have to read it every week to see what the newest happy challenge is! As the weather gets colder and the days get shorter, it can be difficult to motivate yourself to workout – all you want to do is stay snuggled up under a blanket with a cup of hot chocolate and a movie. But while this may make you happy while you’re doing it, it doesn’t have a long-term effect on your happiness like exercise does. When you exercise, your body releases endorphins, which are the feel-good chemicals in our brains. The effects of the endorphins last long after you exercise, which is why it’s such a good happiness booster. Frequent exercise has also been shown to lower stress levels, help you sleep better and can improve self-confidence, which are issues that affect people’s happiness levels too. The other great thing about exercise is that it helps you forget about all your stressors while you’re doing it. I know that when I go to a boot camp class, I’m always too busy trying to figure out the next exercise to think about anything else! If I’m struggling with an issue at school, I’ll go for a run to clear my head. When I’m finished, I find that the answer is usually much clearer, and I’m ready to tackle the challenge. Exercise is the best problem-solver! Try a new form of exercise this week! Maybe it’s swimming laps at a community pool or trying out a Zumba class with your best friend. Or maybe it’s running around a park with your kids or walking a nature trail before the last of the leaves fall. Just get your body moving! Even 20 minutes a day can make a huge difference!